When a favorite fiction author has a new book, I just dive in. 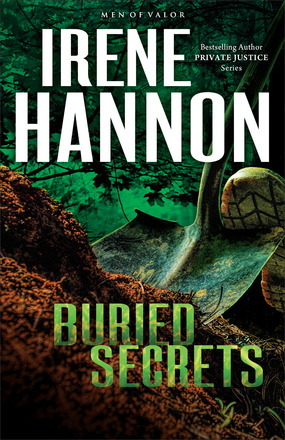 With “Buried Secrets,” Irene Hannon dives right into the story. And I like it that way. The first in a new series, I enjoyed getting to know new characters. Lisa Grant is a former Chicago homicide detective now working as a small-town police chief. Her call for assistance brings in Mac McGregor, an ex-Navy SEAL who works for another local department. They work together to solve the mystery – one that begins with the discovery of some human remains and continues with a suspect who wants that secret to remain buried. Personally, I love St. Louis and like a favorite city of mine as the setting of this novel. Plus, the story briefly goes to Paducah, Kentucky – which is just about 45 minutes from my home in Murray. I like the local references, even if it’s implied the character settled for less by living in small-town Kentucky because of how the buried secret affected him. McGregor’s brothers – also special forces operatives – make appearances when they’re stateside and I’m looking forward to getting to know them in Hannon’s future installments of the Men of Valor series. “Buried Secrets” is a quick read because Hannon’s story is engaging and leaves readers wanting to know the outcome – for both the case and personal lives of the detectives. And now it has me eager for the second book of the series. Well done, Irene Hannon. ABOUT THE BOOK :: The first in the Men of Valor series, “Buried Secrets” is published by Revell and officially releases next week. 384 pages. ABOUT THE AUTHOR :: Irene Hannon is the bestselling author of more than 45 novels, including “That Certain Summer,” “One Perfect Spring,” and the Heroes of Quantico, Guardians of Justice, and Private Justice series. Hannon and her books have been honored with numerous awards. She lives in Missouri. Learn more about her at www.irenehannon.com. Thanks to Revell Reads for an advanced copy of this book to review. The opinions here are my own. I'm linking up with Jessica Turner's Fringe Friday because reading is how I like to spend my fringe hours, which are pockets of time carved out for self-care. Sounds like a great read, Kristin! I've been wanting to get back into fiction as I enjoy it so much but have been reading a lot of non-fiction lately. So many books, so little time. ;-) Thanks for sharing. I just checked it out on Amazon. I go through phases with fiction - but always end up wishing I read more of it. When I sit down with a fiction book it kind of feels like vacation, even if I'm sitting in my own house. :) Thanks for coming by here, Abby! I know that feeling - I'm always adding stuff to my Amazon wish list, but it's impossible to keep up. So. Many. Books. I haven't read Diann Mills' latest yet, but did just read "Footsteps" by her and enjoyed that one!